The residents of Springfield are overtaken by evil alien body snatchers in Sunday’s “Treehouse of Horror XXIX” episode of The Simpsons (Fox, 8/7c), but we’re here to discuss a far more dire confrontation. 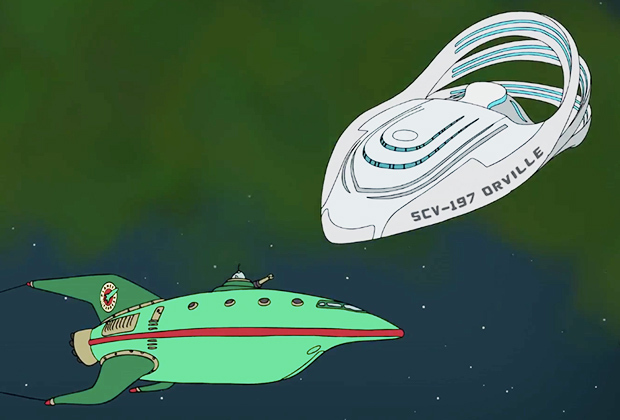 As you’ll see in TVLine’s exclusive clip from the episode, this particular segment features two very familiar space ships — Futurama‘s Planet Express and The Orville‘s titular vessel — and their meeting isn’t exactly a friendly one. Planet Express is the first to appear, proudly displaying a banner that reads “Bring Back Futurama,” a sentiment I think we can all appreciate. Well, all of us except the crew aboard The Orville, who decide to… actually, I won’t ruin the ending for you. For those who don’t speak fluent Fox, here’s some background: Futurama was an animated series from Simpsons creator Matt Groening that ran from 1999 to 2003 on Fox, then enjoyed a second life on Comedy Central from 2008 to 2013. And The Orville, a live-action sci-fi comedy from Family Guy creator Seth MacFarlane, will return to Fox for its second season in 2019. Elsewhere in this year’s Simpsons Halloween episode, Homer challenges Cthulhu to an oyster-eating contest, Lisa “finally snaps” and Mr. Burns builds a retirement home with a Jurassic twist. Hit PLAY on the video above for a sneak peek at “Treehouse of Horror XXIX,” then drop a comment with your thoughts below.